Welcome to the Bull Pens message board! WELCOME TO THE WORLD OF THE HIGH VOLTAGE LINEMAN! THIS PAGE IS DEDICATED TO THE MEN AND WOMEN OF THE POWER INDUSTRY WHO HAVE LOST THEIR LIVES BRINGING ELECTRICITY INTO YOURS! for the most part go unnoticed as they perform a very dangerous but rewarding job. For the average person who knows nothing more about electricity other then that when you throw a little switch your light comes on. I hope that this page brings some insight into the behind the scenes activities that makes it all happen. I hope to have this page updated often so please check back frequently!! Most power companies pride themselves on the fact that most of there work is done while the system is still energized. this is also refered to as "HOT LINE WORK" or " WORKING IT HOT" The first thing that one needs to keep in mind when you hear these terms is the fact that what they refer to are High voltages. High voltages are defined as any voltage above 600 volts mesured to a ground source. More typicly the work is done on voltages above 2400 volts. Many companies distribute several different voltages ranging from 2400 volts to 34,500 volts. Medium High Voltage, in the area of around 115,000 volts, Extremly High Voltage 765,000 volts. Much of this depends on a companies needs and its customer base also the size of the company is a factor that would be considered as to what level is used. You maybe wondering at this point how in the world does one work on something that all their lives they have been told not to touch! Well there are many different methods that are used. The two most common methods also the oldest are, The Rubber Glove Method and The Hot Stick method. Both methods are very specialized and the later of the two mentioned even more so then the first. The Rubber Glove method means just that. 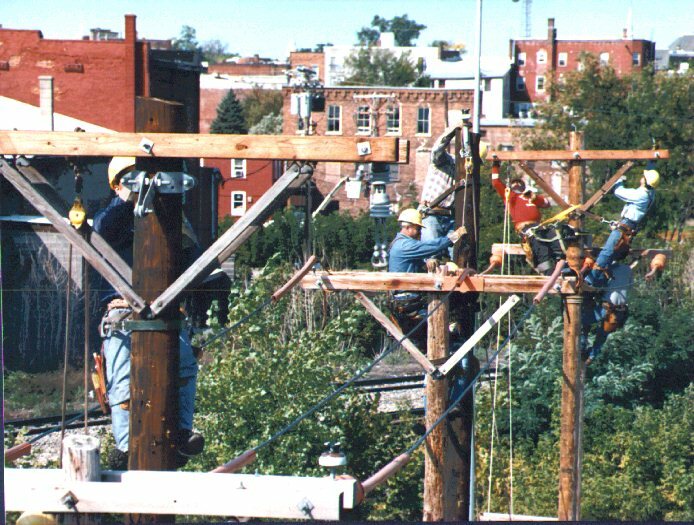 The lineman wears a pair of rubber insulating gloves and rubber sleaves that are full arm length. this method allows you to come in complete hand contact with the energized conductor. This allows the lineman to complete the needed repairs to the line totally unoticed by you the customer. These gloves being the only true protection for the lineman are tested each time before being used for there insulating integrity. This ensures the linemans saftey and protects them from near certain death or severe bodily harm if they fail to function in the manner they were intended to. 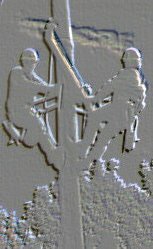 The Hot Stick Method consists of a team of linemen that are specially trained in the use of insulating sticks of various lengths and diameter, and different tool attachments.this allows the the linecrew to manipulate the conductors in such a way that they can perform the needed repairs. These special teams are considered by many to be the cream of the crop of pole climbers and it requires them to have execelent abilities along with a tenacious level of patience. The following is abstracted from an article by Arthur Huntington," The Lineman and His Lingo" Dated 1939. Some of these terms are still being used today! Baloney bender---->a wireman that works with heavy thick cable. Bible---> the electrical code book. Boomer--->a lineman who quits a job before the rest to get to the next job before the others get laid off. Bull Pen--->where the linecrew collects before and after work!!! Limberneck--->A good groundman because he is always watching what his lineman is doing on the pole! Hooks---> pole climbers that are worn on your boots. Rabbit/Scrape Copper--->collected and traded for tabacco and liquor. Skinner---> the one who drives the truck. Tool Buddy---> Your partner on the pole! Hows This For A class Room? Shadow Day 1997! more pics! This Is Your Brain,This is your Brain on DRUGS! ANY QUESTIONS?! Be sure to check this out!!! This is how I got my training! Visit this linemans page for more great pictures of lineman DOING IT HOT!! Go Here to find out about the LINEMAN RODEO! From Fredrick Oklahoma its CD THAYER with his new web site!